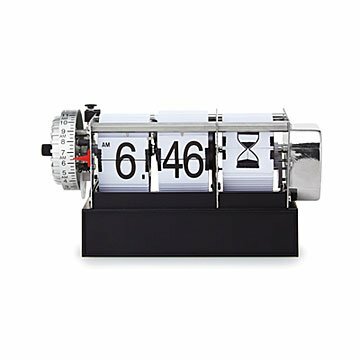 This playful clock has a creative take on the time: the numbers tell the time, while the hourglass reminds you that it's always passing, flipping animatedly from full to empty throughout the day. Display the design on your desk for a clever conversation-starter that reminds you to take things with a grain of salt— er, sand. Made in China. Click here to see our Bad Dog Flip Clock. Clock works great, has an alarm, keeps time well and is very quiet. This was a great stocking stuffer. This was well received. I like giving gifts that are unique, and one that the receiver will enjoy. This clock did both. I am very happy with this purchase. This clock is definitely an eye cather. It's a unique design and is very attractive. I think it's worth the money. The only con is that that it's difficult to sync the second numbers with the minute and hour numbers. Also, a few of the flip tabs can come loose and fall off. This clock is exactly what I was hoping for! It looks great, is the perfect size and it keeps great time. It even has an alarm! I was a little concerned about how loud the flipping number cards would be, my husband is annoyed by noise while he's working, but the flipping cards are quiet enough for him to display in his office. I highly recommend this gift for any occasion.